Hello my dear readers! I'm so sorry that this space hasn't been updated for quite some time. I know I keep saying the same thing but there's only so much I can do now since I'm still trying to juggle between internship, events and photo shoots. Give me 2 more weeks and I'll finally be free! I honestly can't wait for July to come. It's that time of the year for me to start doing GREAT things in my life and I assure you that you'll love this space a lot more then ;) Keep a look out yeah! I really can't wait to break two huge good news but I'm just waiting for the right time to come in case anything disappointing happens. Hey, good things have to wait right? Anyway, Miss Ams, aka Asyiha, and I met a few days ago and we did quite a handful of things in just half a day. Pretty efficient eh? Our meeting started out in the morning with a consultation at IDS Clinic with our skin doctor, Dr. SK Tan. After which we headed for lunch and ended our meet up with a pampering pedicure session. First of all, I have to comment that though a lot of steps are needed to be done diligently every night in order to achieve great skin with IDS products, I am honestly starting to see improvements in my skin. I'm trying to find time to write a full post on the condition of my skin so keep a look out for that too. I'm sure that you'll see a difference because I seriously do! I don't wanna jinx it though! I brought Asyiha to try the famous KL Kin Kin Chilli Pan Mee because she couldn't make it for the closed door session the other time. I've already written a review for this delicious delicacy, so if you'd like to know more about it, you can read it here. It's basically really good, I mean REALLY GOOD dried Pan Mee aka Ban Mian served with their signature sambal chilli. Asyiha was a little too hungry so she ordered an additional side dish- The meatball soup. I was feeling too full from my bowl of noodles, I hardly touched any of those balls in the end! Up to this date, I can't get over the flavourful taste of Kin Kin Pan Mee! It will always be one of my favourite dishes. At times, the noodles can get pretty dry and tough but that's easily solved by just adding a spoonful of soup! As mentioned before, this time I made sure that I only added a teeny whinny bit of chilli. hehehe. Oh gosh, it's so good, I might end up eating it alone again tomorrow after my photo shoot. Asyiha and I were bound to Gushcloud's office after that to collect our..... PAY CHEQUES! hehehe. Gushcloud has been keeping up to the promise they made last year at the Royal Blue Christmas Dinner. We've been getting our pays on time this year and I'm so proud of them! hehe. Anyway, we made a quick stop at one of the little manicure shops at Toa Payoh before heading to the office. I really love the new office location. It's way much nearer to my home and it's only a few stops away from Fai's! Not to mention, since it's in Toa Payoh, they're so many more food options. No wonder my GC managers are getting fatter! HAHA KIDDING!!!! Asyiha and I both have our own nail sponsors but we only usually get our finger nails done there. What are pretty finger nails with ugly toe nails right? Hence the decision to pamper ourselves with a classic pedicure session. I LOVE CLASSIC PEDICURES. My feet are the ugliest part of my body. I hate modelling shoes because I'd inherited pretty ugly toes from my mom. HAHA. She told me that herself okay! She's always like "eeeeee.... Mei, look at your toes, they're like mine. So ugly!" hahhaahaha! Yeah, so I've grown to hate my feet. I'll take a picture of them and most it here next time to convince you. It's filled with veins and bones. Yuck. Mandatory selfie. Gosh. Help my eye bags. Asyiha and I bid farewell around evening and went separate ways. While she went on her date, I headed to Salon Vim to work on my hair. In case you weren't aware, I've been wanted to get an ash grey colour since the day I started this whole bleaching thing and if you count, it took me about 3 to 4 bleaching sessions to finally achieve it! According to my stylist, Sham, I have REALLY black natural hair. Usually, a normal head of hair would only need about 1 to 2 sessions of bleaching to get that gorgeous ash grey or platinum blonde locks. But I needed more sessions and more time :( Then again, it's worth the wait! Now I can have pretty coloured hair without worrying about split ends or dry and brittle hair. Sham examining his product and giving my hair a trim. I can't believe that I used to have really long hair. I remember walking into Salon Vim about a year back convincing Sham to never cut my hair, while he was doing otherwise. But after my frequent visits to Salon Vim, I've grown to realised that shorter mid-length hair tend to look a lot healthier and a lot more sophisticated. I doubt I'll ever want really long hair anymore, it just weighs down too much on my scalp resulting in excessive hair fall. Also, it's way much easier to maintain shorter hair! No wonder everyone around me are starting to chop everything off into a bob. I guess things like this just comes naturally as you age. Thank you Sham for the awesome hair makeover! If you're interested in my hair colour, simply book an appointment with Salon Vim and probably request for Sham as your stylist as well? How we came about this Blue-ish-Ashy-Grey colour was from a photo inspiration I'd sent him. It was a picture taken from an international blogger's Instagram. Sham was so dedicated and determined to help me achieve the exact same colour that he followed that blogger as well and studied her hair! When I learnt about this, I was both touched and impressed by his professionalism. Here's how my mane looks like two days after a wash! I've also changed the colour of the rest of my hair from the usual brown to copper-red. According to Sham, it's one shade lighter then the usual. I remember only agreeing to dark colours and there was a point of time where I'd only want really black hair. All has changed now and I'm going for a lighter, more vibrant look! Everyone at Salon Vim were surprised to see me with a lighter hair colour (Not that it's really light but it's just different from what I'm used to). Hollyhoque, pronounced as “Holly-Hock” is derived from the name of a flower, Hollyhock, which literally translates into "fruitfulness”. Hollyhoque shall be every girl's dream wardrobe updater. With weekly themed launches aimed generally at fashion forward 16-35 year olds, Hollyhoque carries an extensive range of today's fashion at wallet-friendly prices. 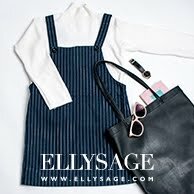 Hollyhoque’s apparels largely consists of uniquely manufactured items carrying its very own in-house label and many other items sourced from practically all over the world! It's pretty easy to spot their chic and minimalistic looking shop. As always, shopping at Hollyhoque is always a breeze. I am sure that you're aware of that if you've shop at either their online boutique or their physical store at FEP. We all would prefer to shop at a place with great lighting, easy access to a mirror and a great variety. It's great that Hollyhoque's new outlet meets all those requirements! You'll be welcomed by not just their friendly staffs upon arrival, but also their wide variety of tops of all kinds of colours and designs. It made me realise that Hollyhoque's a shopping destination that's catered to almost anyone of any shapes and sizes. My favourite section of their shop would have to be the showcase of their classy and sophisticated semi-formal dresses, and printed shirts. I had my eyes set on the white marble shirt you'd see in the photo below. In fact, to be honest, it's so tough picking out my favourite pieces because there's just too many options! I'm sure that you'll know exactly what I mean when you visit their store. Apart from apparels, Hollyhoque also offers a wide variety of accessories to style and jazz your outfits up. I can't help but notice how gorgeous ALL of their necklaces were. I personally own tons of necklaces but if I could have all of these from Hollyhoque, I would be a VERY VERY happy girl. hehe. They're all so pretty and I can totally imagine myself wearing them often because they're so trendy and versatile! I love their huge mirror! I've had enough of sharing a tiny mirror with a complete stranger in a boutique. Don't you get really irritated at H&M? It's quite a nuisance to share their mirrors with other shoppers with so little space around right? I must say that Hollyhoque gave a lot of thought into this, hence making their store a delightful place to be in. The best part of shopping would definitely have to be trying on the apparels! Well, I get pretty lazy to do it some days but it's always better to try them. Some times, clothes just look a lot better when it's worn, while some looks better left on the rack. This clean and simple white vest looks even better when it's worn though! I've been contemplating on getting one for the longest time and I finally went for it at Hollyhoque. The amount of ways to style this vest is endless and I love how crisp the fabric of it is. Pretty much the sort that wouldn't crumpled easily hence allowing you to look sophisticated all day long! As mentioned earlier, I had my eyes set on their white marble shirt so it definitely had to be one of my picks! In case you're unaware (which is highly unlikely), marble prints are everywhere! They're such a huge hit and I don't see why it shouldn't be. It's classy, contemporary and clean. Personally, I am a HUGE fan of marble tiles, I would love the floors of my future house to be of the exact same prints as this top you see me wearing in the picture below. I love how well it looks with anything. I've paired it with a faux leather basic skirt and the Hollyhoque cross-body bag I was talking about earlier! hehehe. The best part of the shirt would have to be it's sheer and lightweight fabric, it's perfect for braving the heat in humid Singapore! I showed Fai the bag the moment I met him after my visit at Hollyhoque and he couldn't stop complimenting it. hehe. The chains are undoubtably heavy but that doesn't really bother since I'm already always carrying heavy bags so that got me pretty used to it. Come on, without them, the cross-body would just look like any other bag but it looks really legit and it's definitely a statement piece that I think is worth to own. Once again, Hollyhoque is located at Orchard Gateway B2-02 (Underpass between Orchard Central and 313@Somerset). Nearest MRT station is Somerset. DUH?!?! hahaha. They're open from 12noon to 9.30pm. For more information, follow them on their social media platforms! As always, I own tons of Carrislabelle apparels and I'm still not complaining! They're always so gorgeous and I have to admit, it's getting better and better with every collection. 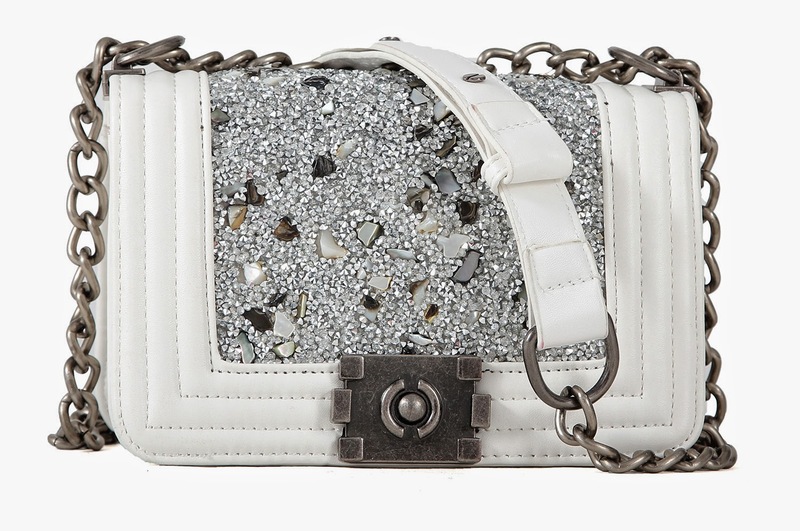 This time, I'd picked a Chanel inspired bag that's TOO PRETTY! I will never have enough of little black dresses and I just can't seem to pick a favourite one either! This Slit Cut Tube dress would have to be the piece that I'd go to when I feel like dressing a little simpler. Leonardo de Vinci once said "Simplicity is the ultimate sophisticated." and here's a little black dress that speaks volume of that phrase. I don't know if I'll ever get a legit Chanel in future but I'm fine settling for an inspired now :) This GORGEOUS inspired Chanel Boy bag is too die for! I was so mesmerised by how sparkly and structured it is. Without a doubt, it's quality is really good and you can really tell that it's a pretty durable bag. WORTH INVESTING IN! to receive the latest updates and exclusive promotions just for mailing listees. Besides that, my dear readers get exclusive discounts! Did you know you can get them ON AUTOPILOT AND ABSOLUTELY FOR FREE by using Like 4 Like?